Works of art, collected by the late actor Dennis Hopper, are expected to fetch up to $13m (£8.3m) when sold at Christie's auction house in New York. The collection of more than 200 works, includes pieces by Jean-Michel Basquiat and Andy Warhol. Christie's Cathy Elkies described the collection as "personal, meaningful and ultimately, significant to the market." Thirty-five pieces will go under the hammer in November and another auction will take place in January. Basquiat's Untitled is expected to be the top seller with an estimated price tag of up to $7m (£4.5m). A 1971 portrait of Hopper, by Warhol, is expected to fetch up to $1.2m (£770,000). Works by Robert Rauschenberg, Wallace Berman, Bruce Conner, Keith Haring, Marcel Duchamp and Julian Schnabel, will also be sold off. 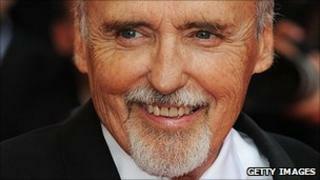 Hopper, who starred in and directed the 1969 movie Easy Rider, died in May of cancer at the age of 74. "Dennis Hopper was the consummate creator," said Marc Porter, chairman of Christie's. "His pensive, personal collection of art reflected his strong, deep bonds with the artists whose work he collected."